why are you shaking like a leaf? 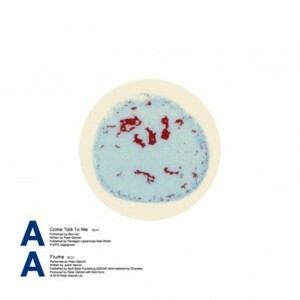 I got the split 7″ of Peter Gabriel and Bon Iver covering each other, and it’s been repeatedly blowing my mind ever since. For something so small with only 2 songs on it, it is astounding the amount of enjoyment I am getting from this pressing. Where Peter Gabriel’s original is sweeping and epic like a rippling African grassland and a thousand drums, Bon Iver’s version builds slow and haunting, and the plucking banjo sounds for all the world to me like rain on a roof. As the rain howls outside tonight and patters against my skylight, I’m reminded how that has always been one of my favorite sounds. a John Lennon Singles Bag (limited edition, 1765 of 7000) pack of three 45s with original artwork (Mother b/w Yoko Ono – Why, Imagine b/w It’s So Hard, and Watching The Wheels b/w Yoko Ono – Yes, I’m Your Angel), a 24×36 poster, 3 postcards and a custom plastic adaptor hub. Yeah. Rad. That and the Bon Iver/Peter Gabriel split, and I’m $45 lighter and 145% happier. Oh, and free Great Divide beer too? The mood in the store was jovial and festive; a music-lover’s Christmas, Halloween, birthday and Hanukkah all in one. Saturday was one of the best days of my year – and I’m not the only one who thought so. Record Store Day 2010 underscored an increasing and surprising revitalization of the independent record store and the niche it plays in our lives. Paul, the owner of Denver’s famed Twist & Shout Records on Colfax wrote the following musings about Record Store Day. They make me very, very happy. “I stayed on the floor the entire day and I did not hear one cross word. I didn’t hear one complaint or demand. As the customers clustered around the bins I would hear people call out ‘Here’s the Black Keys 12” – who needs it?’ They were actually helping each other. I saw at least 20 ex-employees. Nothing makes me happier than that. I was also gratified by the number of customers just wishing the store well in a general sense; long time customers, first-timers, a surprising number of out-of-staters who traveled for the event, people of all types just happy to be there and happy to see a real record store still in existence. Tagged with record store day, vinyl. Mine too, well at least one of me favs of the day. Josh Ritter’s new LP with a bonus copy of the CD inside wasn’t so bad either! Amazing record – I completely agree! This was the first album I purchased new in years. 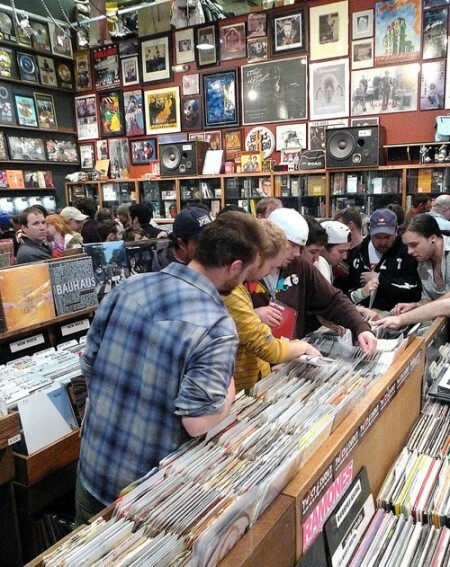 I was amazed by Record Store Day here as well. Our local shop is Vinyl Fever in Tampa,FL. I wanted to take my daughter of 17 months for her first trip to the record store and make it memorable. I didn’t expect a line around the building, but that’s exactly what we found. I was carrying her and when we got inside the crowd was huddled around the RSD special wall and I couldn’t really get in there. I spotted the Bon Iver single and I got close enough right as a guy was grabbing one to ask “Can you grab me one of those?” He handed it to me with a smile and a “No problem.” The crowded store was exactly like that – packed with people that were completely into music, no pushing, just helping each other and chatting about their new discoveries. A more perfect intro for Ella into the world of music stores would be hard to imagine. Good stuff Heather! My local record store in NJ had 30 people lined up when he opened the doors. The manager said he hadn’t seen that in 10 plus years. I got there about an hour later and the store was pretty crowded still. I only walked away with the Tegan and Sara 45 but I just loved walking around, looking and talking to people about music. Was a very cool day as usual. Record Store Day would work better for me if I had a record player. Independent Records had a lot of RSD vinyl, but didn’t seem to have all that many RSD CDs. You know my love of Nada Surf, so I picked up If I Had a Hi-Fi. Thanks to American Idol, and probably more specifically Paula Abdul, I hate when someone says “you really made it your own” in regards to a cover song. But, Nada Surf did exactly that. All of the songs on Hi-Fi sound like Nada Surf songs, not Nada Surf covering someone else. I’ve only listened to it twice, but so far, so good. I took the kiddos with me to RSD. The got to see a Pueblo “rapper” (more sort of staccato singing than rapping)who was really bringing it is spite of singing to only ten or so people. Looks like his website is http://www.madeupminds.com if you’re interested. I’ve always had a soft spot in my heart for Peter Gabriel’s “Come Talk to Me” and I guess “Us” in general. The Bon Iver cover is fantastic; thanks for sharing Heather! It’s really interesting stuff. I got there about an hour later and the store was pretty crowded still. We have a VERY small record store in our city and there were probably 20 people lined up (with more popping in as the morning passed). The Bon Iver was on my list, but I have no idea if it was even available since most everything got scooped up by the first few people in line. It was so sad to see the Beach House and R.E.M. exclusives pass before my eyes into someone else’s arms, lol. But, I still picked up some non-RSD items, like a Frightened Rabbit 7″, some Foreign Born, and the Ruby Suns new LP. Good times at RSD! I’m glad you picked up the Bon Iver! Any chance you could share the Fanfarlo 7″. I was out of the country on record store day. Saw Fanfarlo in Chicago in March and absolutely loved the show and fell back in love with that album. Love this song, thanks so much for sharing, wish I had a record player to enjoy this on!